For some reason I cannot rotate this picture. The problem with stealthily writing at work. Anyways, the plan yesterday was to grab some sushi with my cousin after a gym session. As with most plans with her go, they fell through and I was left with the option of eating solo. I tend to do that a lot. Don't really mind it, but sometimes conversations while eating are nice. I was going to get sushi. Really was. But then I had to fill up the car and it just so happens there is a Cumberland Farms by the gym. So here I am, post-workout... exhausted and gym messy. The water I had been guzzling was not cutting it. Screw it. Slushies all around! 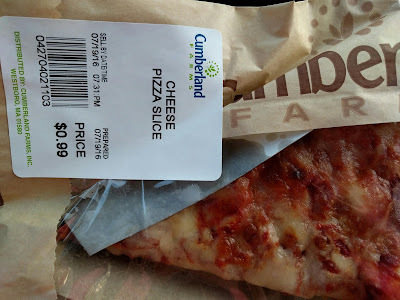 And while I was there, I spied their 99 cent cheese pizza slices. How could I possibly pass it up?